Way back in August, hubby and I tore down a big shed in return for the materials. We arrived at the site before 8:00 am so we could hopefully be finished before it got too hot. "Hot" in August in Oklahoma is a relative term. We lost a lot of weight in sweat that day, but we did finish before the heat of the day really set in. After an hour or two our helper arrived. I was in charge of removing the screws on the metal panels, as far up as I could reach. The two men did the rest. 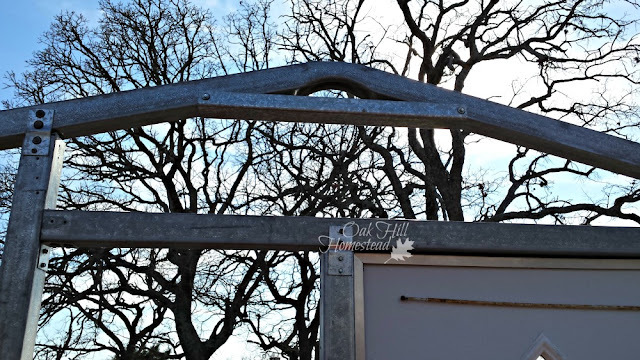 We stacked all the metal on the trailer and took it home, unloaded it in the barnyard, and there it sat until November when hubby began feeling better and the weather had cooled down. Hubby cleared the new site with the tractor, leveled it, and then began building the floor. 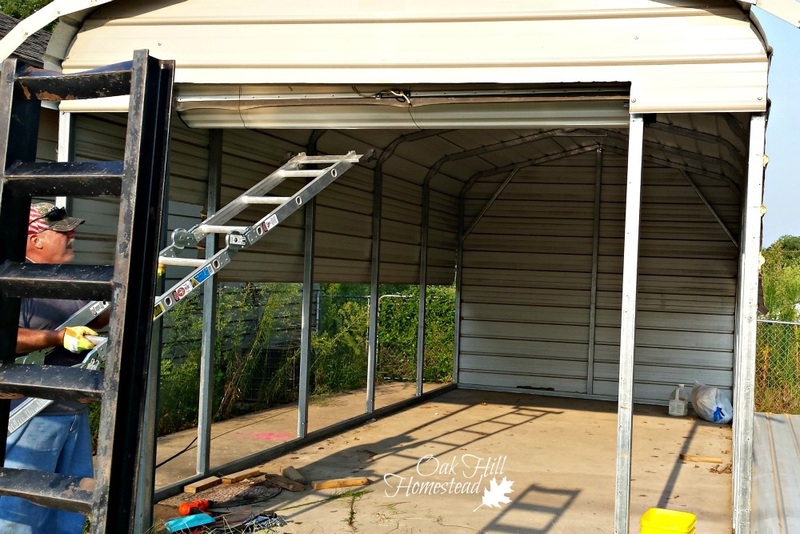 Although the shed had been used as a garage in its previous life (above picture), we won't be parking in it, so a concrete floor isn't necessary. 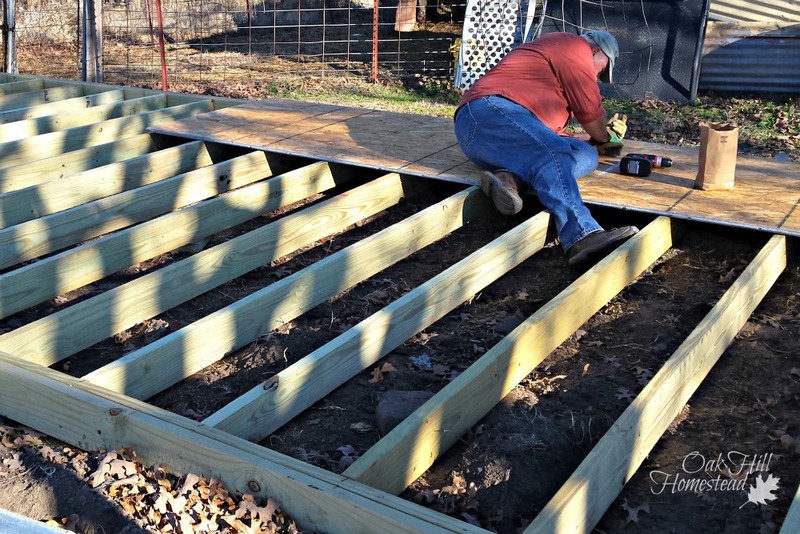 Hubby built a wooden floor instead. We remade the shed smaller than it was originally. Yes, it would have been nice to have such a big space, but it's still bigger than what we had been going to purchase before we fell into this deal. The two of us installed the bottom rails around the edges. 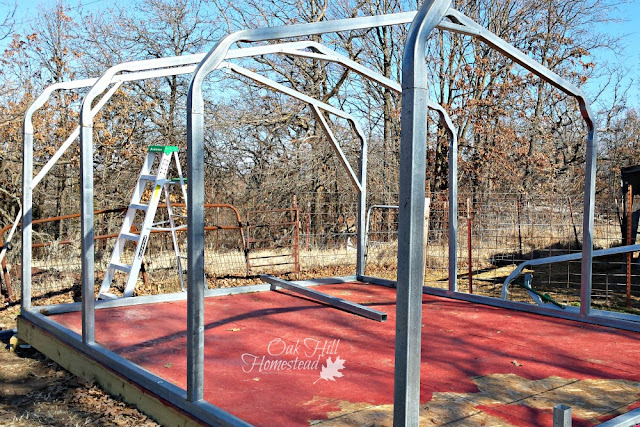 We put the sides and roof frame pieces together and lifted them on top of the rails. I held each one in place while hubby screwed them into the bottom rails. We won't be using the overhead door; instead, we installed the walk-through door in the front side of the shed. 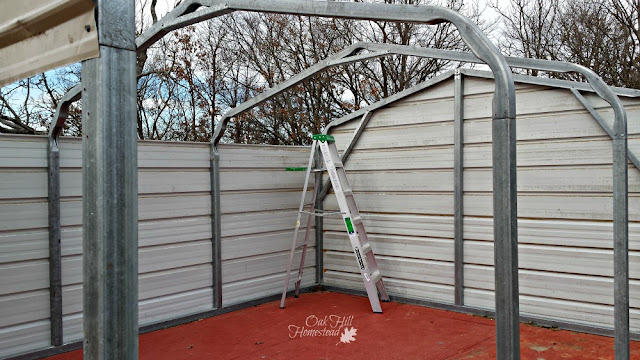 Roof panels are a challenge, especially in windy weather. This past weekend we had high winds forecast but when I went out to do the chores on Saturday morning the winds were calm. We started working immediately. 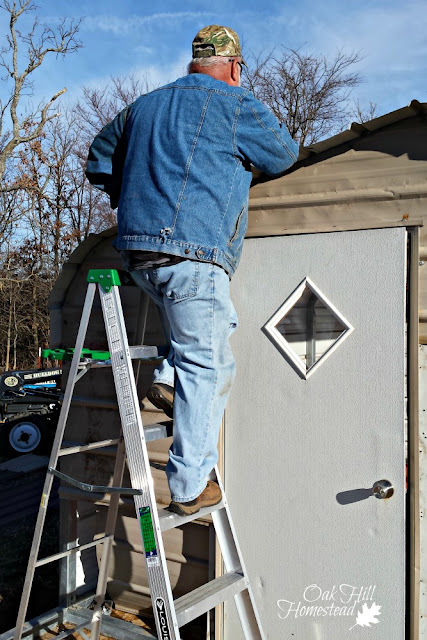 The wind came up in the early afternoon but all we had left to do by then was the trim. Our recycled shed cost us a bucket of screws plus the materials to construct the floor. We rented a longer trailer when we tore it down, because the metal panels were twenty-five feet long and our own trailer is only sixteen feet. The rental was about $75. And the value of our labor of course. Quite a bit of labor, but it was worth it. 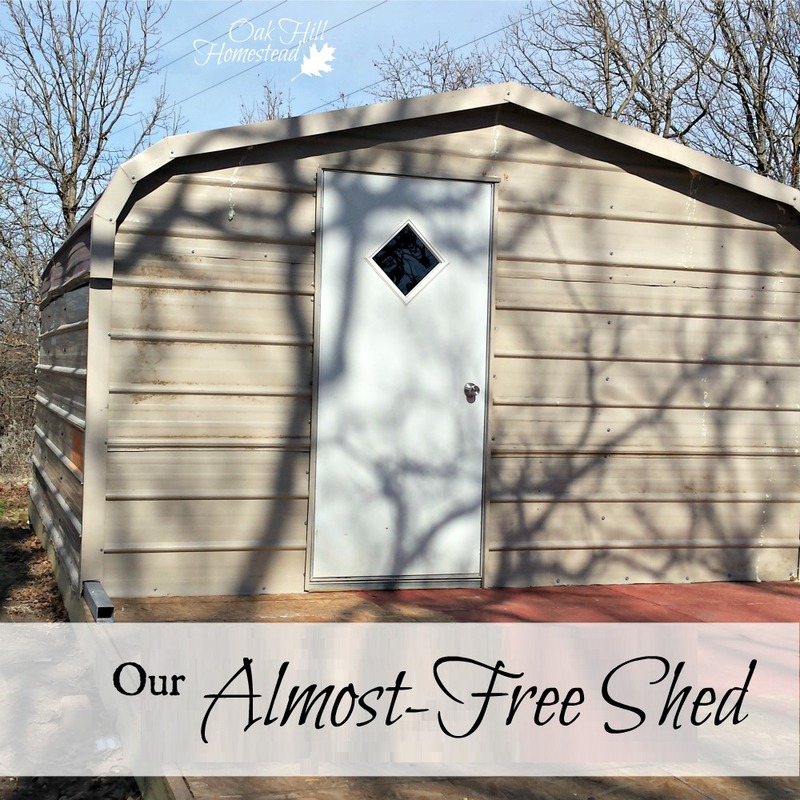 What a fantastic deal you landed on with this awesome shed! You and hubby did a fine job rebuilding it too. I'm sure you will be able to put this to good use. 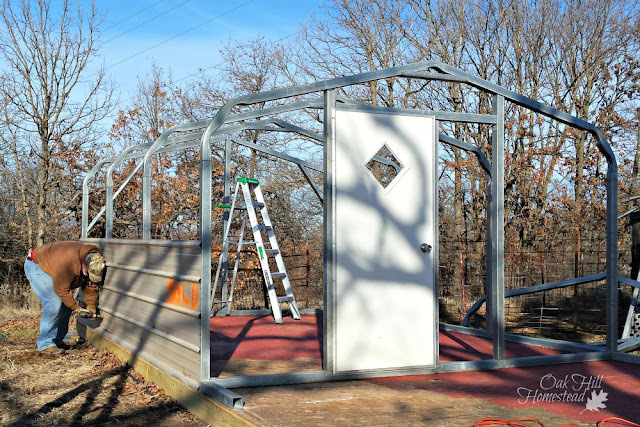 You didn't mention what you will be storing in this new shed. I know I shouldn't be............but I'm jealous! 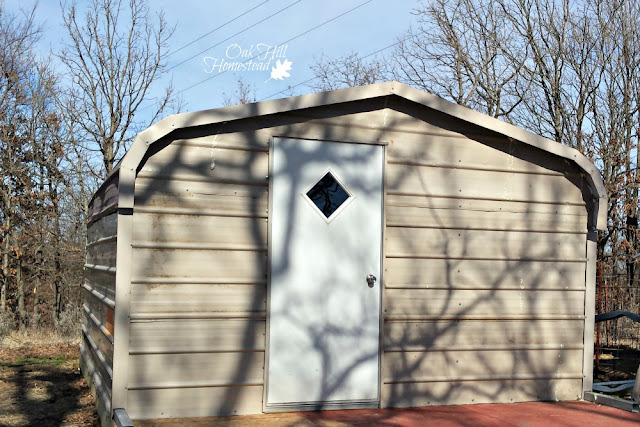 Love, Love, Love this shed! What a wonderful deal for you and for the other person! You guys did a great job rebuilding it. How great that you were able to give this shed new life! I love it when things get repurposed. Makes Mother Earth happy, too! Your hubby did a fantastic job! So nice to have handy men around, huh? Is this going to be a potting shed? Daisy, thank you. 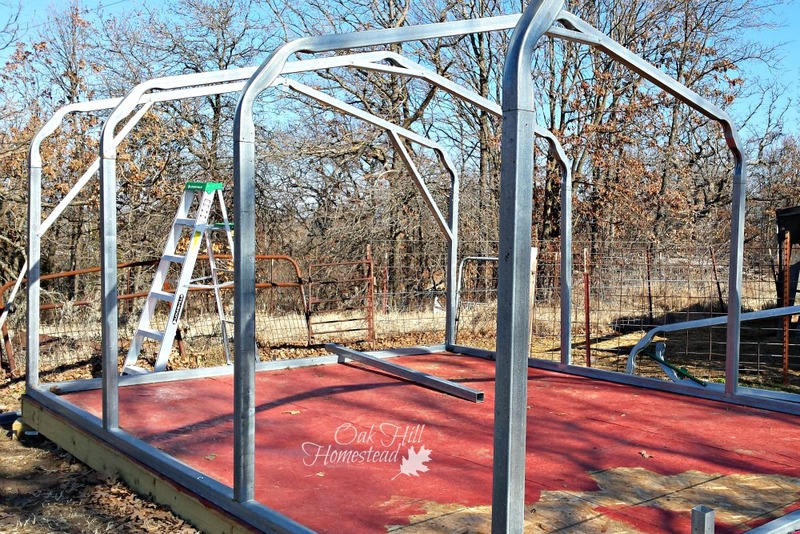 It will be a storage shed but that will include storing the lawnmower and gardening stuff. :-) I'm proud of what hubby did with it, for sure. Wow, that looks like a huge project. It turned out great! Sarah, it was definitely a big project! We are relieved it's finished. :-) Thank you. That's a great deal! It's smart to keep your eyes peeled for deals like this when you know a big purchase is in the works. It's always a good thing to look ahead, isn't it, Jamie? Sometimes things fall into your lap. Lucky you! And for a bit of hard work, you got a bargain! Carolyn from Pastimes, Passions & Paraphernalia. I love seeing people put in the elbow grease to bring value to their property. This is a wonderful example of what can be done when you are not afraid of work. Great job! Connie, it was a lot of work but it was so worth it! Saved us hundreds of dollars at least. Thank you. Little Homestead in Boise, it's certainly worth keeping your eyes open, isn't it? 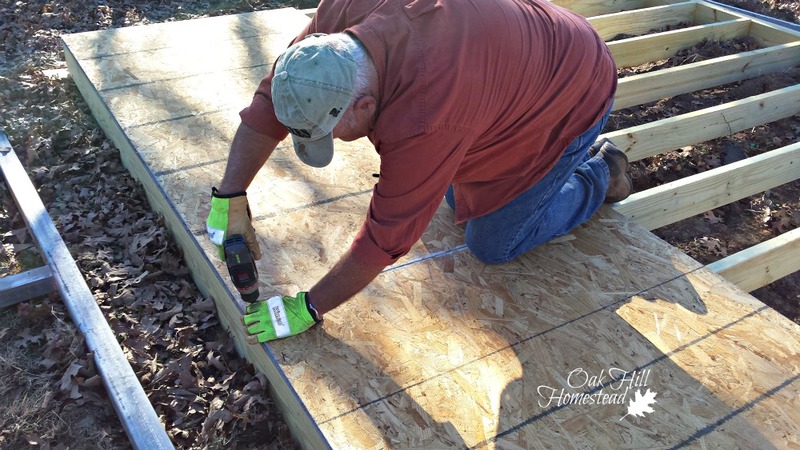 Lot's of work, but what a deal to get all of those materials to use for your shed! It looks great.